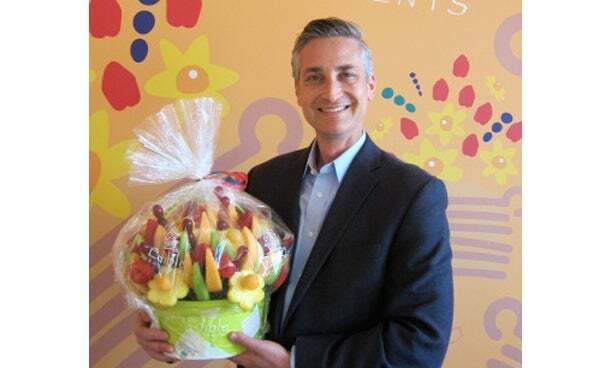 An Edible Arrangements fresh-fruit floral arrangement -- pictured in an airline magazine -- was what first caught Scott Greenberg's eye, and perhaps his tastebuds, too: The longtime motivational speaker had found his franchise pick. Ten years ago, he opened his first store, followed two years later by his second -- both in Los Angeles. Today, his stores are a great source of material and strategies for speeches, as well as "thank you" gifts to his wife, for her support. We opened our first location 10 years ago, and our second location two years ago. Great people align themselves with better people. I’m happy to outsource the innovation, R & D and system development to the experts. Let them figure it out. Not everyone can invent wheels, but a lot of people can make money selling them. I’ve been a motivational business speaker for the last 22 years. That’s still my primary job. As much as my franchise operation serves as a source of additional revenue, it’s also a great laboratory to develop material and strategies to share with my audiences. I was on a flight en route to a speech and the Edible Arrangements ad jumped right out of the airline magazine. I’d never seen a fresh floral fruit arrangement before and was blown away. I thought about how great it would be to receive one of these things. I sent a few to some of my clients and got a huge response. A few months later, I was on another flight to Connecticut to meet the corporate team behind these baskets. They were young and passionate and had a clear vision of how they would grow the brand. They weren’t just in the fruit business; they were in the celebration business, and I wanted in. They’ve been great colleagues and partners ever since. A $25,000 investment bought me the franchise rights and a territory. The build-out was another $120,000, and the delivery van was $45,000. We spent $10,000 on our grand opening marketing campaign, and probably another $25,000 setting up the business entity and other miscellaneous costs. So, [the total was] roughly $225,000. For several months, every time I left town speak somewhere, I’d visit a local Edible Arrangements location and connect with the owner. I also got a lot of advice from my father. He has a lot of wisdom and business experience to share. He’s a serial franchise owner who ultimately opened his own Edible Arrangements locations in another city. I also spent time on the web and thumbed through countless business books. Once I signed on, our corporate office was hugely helpful. Construction was predictably stressful, especially going through inspections with the city. From a marketing standpoint, Los Angeles is a noisy place. There are ads everywhere. It’s always a fight to get noticed. And of course, getting my wife’s blessing to do this at all also took some time. She was the first recipient of a fruit basket! I keynote a lot of franchise conventions. My central message is that success only comes when good systems are driven by a great mindset. That means controlling emotions, trusting your franchisor and fully engaging employees and customers. Don’t use your franchise to prove yourself. Use it to improve your community. That mentality will inspire the best business decisions. We re-upping our first store later this year. A decade into this business, we still have a lot to learn, especially around marketing. But numbers are looking good and I’m excited about what lies ahead.